CARY, N.C. (November 15, 2018) – Hurricanes Florence and Michael, which battered cotton fields across the Cotton Belt this fall, are expected to have little impact on new crop cottonseed supplies available to dairies. 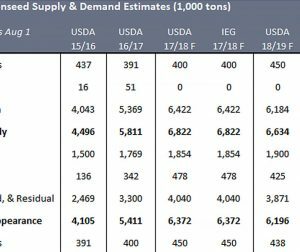 Prices of the triple-nutrient feedstuff remain relatively stable. 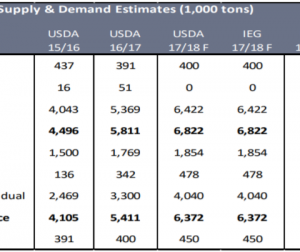 The November 8 USDA World Agricultural Supply and Demand Estimates report pegged the cotton crop at 18.41 million bales, netting about 6.2 million tons of cottonseed, compared to 6.4 million tons in 2017, an insignificant decrease. About 3.9 million tons will be available for feeding dairy cows, compared to 4 million tons last year. “While 2018 provided less-than-ideal growing conditions, fuzzy cottonseed looks to be ‘price friendly,’” said University of Illinois Professor of Animal Science Emeritus Michael Hutjens, a long-time proponent of feeding the feedstuff to high-producing dairy cows. Other key cotton-growing areas, including the Carolinas and Mid-South, were saturated by harvest-time rainfall, as well. “I’m encouraging dairy producers to consider locking in feedstuff prices now,” say Hutjens who calls whole fuzzy cottonseed his “magic” feed ingredient for dairy rations, especially with higher levels of corn silage. “Buy from someone who can evaluate its quality and stands behind the product purchased. Be aware that cottonseed with moisture damage or improper handling can develop mold and mycotoxin risks. To evaluate the cost effectiveness of feeding whole cottonseed, Hutjens recommends using a computer model that includes a dairy’s local feed prices to build break-even prices. “Be sure to select ‘fat or oil’ as an alternative energy source for evaluation,” he said, explaining not to compete or compare with shelled corn or barley, for example. Cotton Incorporated suggests producers get in touch with their cottonseed merchant or feed dealer to check prices, or submit a request for cottonseed quotes through its Cottonseed Marketplace. Cottonseed is an excellent source of fiber, protein and energy. Typical rations can include up to 15 percent cottonseed on a dry matter basis. For more information, including reports on market conditions, feeding information and a list of suppliers, visit wholecottonseed.com. Cotton Incorporated, funded by U.S. upland cotton producers and importers of cotton and cotton textile products, conducts worldwide research and promotion activities to increase the demand for and profitability of cotton.